SemillArte is an association that aims to promote artisan production using seeds from Bolivia's biodiversity as raw material. This initiative has the objective to create opportunities for women in the community called Pampa de la Madre, promoting values of personal growth and independence via improved incomes. Founded in 2006, SemillArte began training women (mothers) in costume jewelry techniques using seeds while their children followed the nutritional program at the social center in the San José parish in the Pampa de la Madre community in Montero, a city in the Department of Santa Cruz, Bolivia. After the costume jewelry courses, the SemillArte artisans were trained in crochet and macramé. They use these three techniques in their creations, which were perfected over time until they became independent artisan creators of high quality products. They reveal that the most important thing they have learned is to value their abilities and to persevere until they achieve their objectives. These women have acquired confidence in themselves and feel that they are completely capable of teaching and passing along their knowledge to other women. Currently (2010), 24 women work in this association that intends to participate in a fair market that recognizes the art expressed in their work. They believe that working with Caserita.com provides them the opportunity to make themselves known and to sell their products in other markets. Association production capacity is 2500 pieces of costume jewelry per month, 100 crocheted garments combined with pieces of aguayo (typical, colorful woven cloth) and 1000 macramé items. 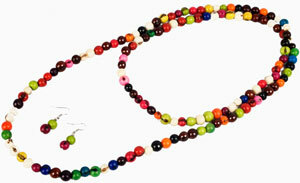 The materials they use in their costume jewelry are spun thread and seeds, all handmade. The artisans themselves collect Amazonian seeds near their homes, and they immediately process them to transform them into beads that they later combine with tremendous creativity. One person is in charge of quality control to guarantee high product value. These 24 women put a lot of love and dedication into making each of their creations which become works of art, and in a way they are transmitting positive energy to the person who has the honor of wearing them. COPROCA, the factory of the future. 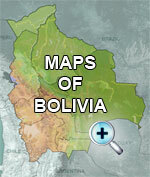 Join us writing, sharing your experiences, photos, news from Bolivia.